(NaturalNews) In the search for a safe and effective treatment for the Ebola virus, researchers from Texas have discovered a novel compound found in a natural Chinese herb that they say works better than any experimental pharmaceutical or vaccine at blocking the virus from interacting with cells, thus preventing it from taking hold and infecting the body. Dr. Robert Davey, a scientist from the Department of Immunology and Virology at the Texas Biomedical Research Institute, and his colleagues say that tetrandrine, which is derived from the Stephania tetrandra plant, also known as the stephania root or han fang ji, blocks a key pathway through which the Ebola virus would otherwise make its way into various cell compartments. Recognizing that a critical first step to stopping Ebola infection is to prevent the virus from entering or interacting with cellular factors, Dr. Davey and his team decided to take a closer look at various substances that might accomplish this. From previous research, the scientists found that calcium signaling in cells controls many of the processes in the cell that enable Ebola infection. 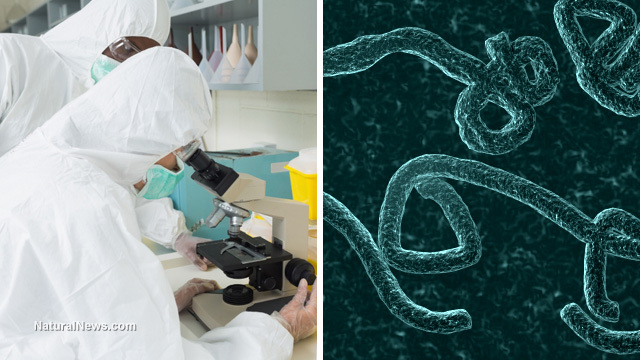 Through their latest research, which was published in the peer-reviewed journal Science, Dr. Davey and his teamed identified two-pore channels, or TPCs, that are the key calcium sensor involved in Ebola virus infection. In order for the virus to gain a hold inside the body, these TPCs have to be turned on, which implies that infection can be avoided through keeping these TPCs in the off position. After looking at various drugs and other substances that turn this key calcium sensor either on or off, the team determined that tetrandrine worked best at keeping TPCs in the off position, effectively preventing Ebola virus from moving any further through the cell. And best of all is the fact that tetrandrine doesn't appear to cause any harmful side effects. "When we tested in mice, the drugs stopped virus replication and saved most of them from disease," explained Davey about the findings. "We are very excited about the progress made in this study and the momentum it provides as scientists across the world vigorously search for effective vaccines and treatments against Ebola virus." Amazingly, tetrandrine demonstrated an ability to stop the Ebola virus before it even had a chance to interact with certain cellular factors. This means that the virus becomes incapable of binding to cell surface proteins, which would otherwise act as the transport mechanisms for Ebola to gain entry into various cell compartments. And like many other natural remedies, the function of tetrandrine in acting as a type of firewall against Ebola infection appears to be unique to this particular virus. By taking tetrandrine, in other words, it does not appear that other necessary substances will be blocked from being transported into the cells, which would probably be the case with isolated Ebola pharmaceuticals. "Tetrandrine, the most potent small molecule that we tested, inhibited infection of human macrophages, the primary target of Ebola virus in vivo, and also showed therapeutic efficacy in mice," wrote the authors in the study's abstract. "The next step in the process is to test both safety and effectiveness of the interaction of the drug with Ebola virus in non-human primates," added Dr. Davey.